Illustrations courtesy: Boimela, Tanmoy Dutta's Flickr photostream. Before the year ends, I thought I should complete what I set out to do in putting together a series of posts on beautiful cover art of Satyajit Ray. 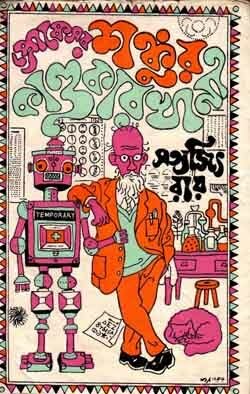 As a graphic designer par excellence, he did a series of covers for reprints of Bengali classics and a series of magazine covers for two magazines consistently. 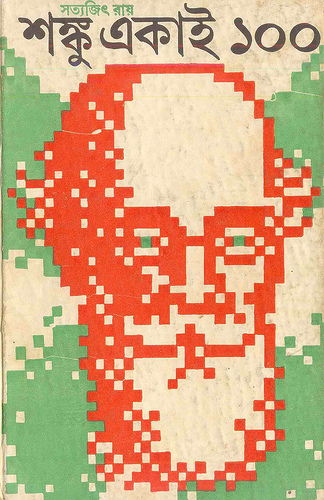 The final part of the series should be the cover he did for his own books - all of which are a study in simplicity. 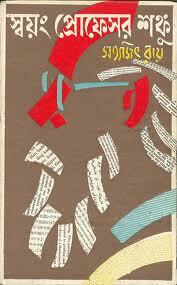 Satyajit Ray was a prolific writer of short stories. 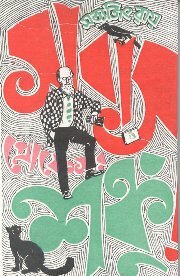 Each collection contained 12 stories and the names were a play on the Bengali words for twelve (baro) or dozen (dojon). 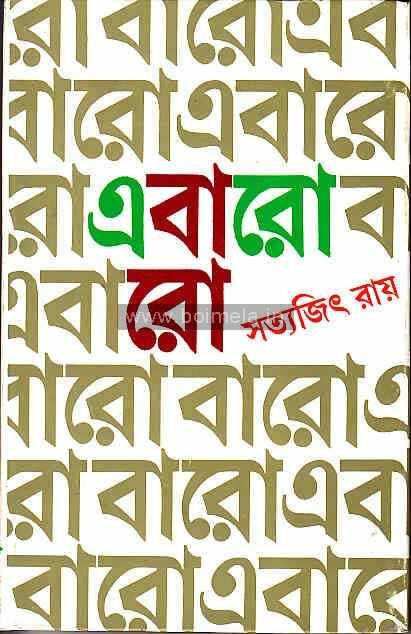 Ek Dojon Goppo (A Dozen Stories), Aro Ek Dojon (One More Dozen), Aro Baro (Twelve More), Ebaro Baro (Twelve Again), Eker Pithey Dui (Two on One) and Bah! Baro (Wow! Twelve). 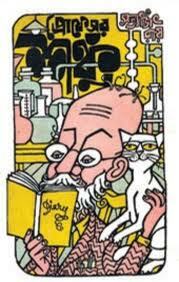 His second-most popular series was, of course, Professor Shonku. The Shonku series started with mock-seriousness almost bordering on parody in the first story. However, the durability of the character was established with that first story and Ray had to invest a lot of gravitas into the character to make Shonku into a world-renowned, genius inventor. 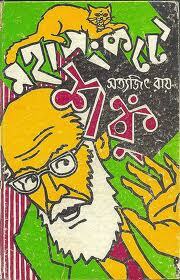 As a complete contrast to Feluda's modesty, Shonku was immodest in matter-of-fact manner. He had no qualms in calling himself a genius and his adventures took place across the globe. The covers reflected his slight eccentricity as well as the international settings. I particularly like Swayam Professor Shonku, where his beard and hair are made out of international newspaper cuttings and Punascha Professor Shonku, where his face has the topography of a globe. 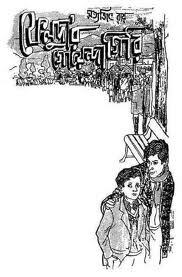 And quite obviously, Feluda has to bring up the rear in true 'last but not the least' tradition. 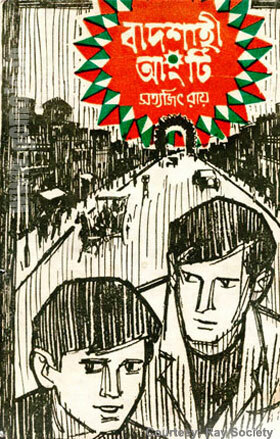 The structure of the typical Feluda cover never changed. 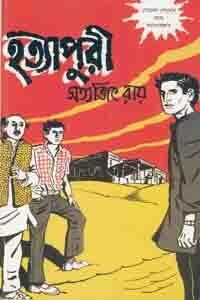 It had Feluda, Topshe and Lalmohanbabu in the foreground and a distinctive landmark of the story's location looming - sometimes menacingly - in the background. It would be interesting to see some of the earlier covers - which are also in the same format - though Feluda and Topshe are much younger (and Lalmohanbabu missing). The first illustration is not a cover but the full-page illustration at the beginning of the first ever short story (when it first appeared in book-form) and Topshe is almost a kid. 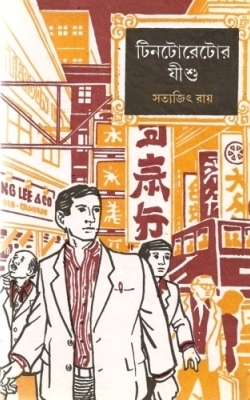 Interestingly, the first Feluda story also did not envisage the durability of the sleuth and showed Feluda as a hobbyist, who happens to solve a crime while on vacation (from a regular job) in Darjeeling. 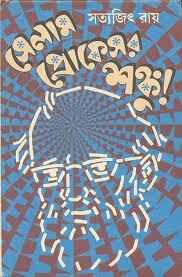 When the story first appeared in Sandesh magazine, the illustration on the first page was almost like a caricature! 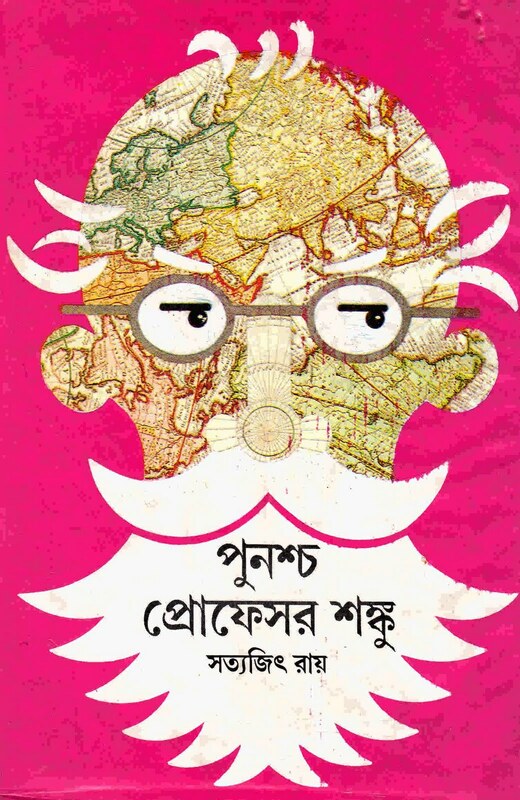 By the time it was published in Ek Dojon Goppo, a few more stories had already appeared, the Bengali bhadralok had got as hysterical as they could have possibly got and Feluda was on his way to become the highest-read and second-most popular Bengali fictional character ever. That, I think, caps off this series for the time being. Warning: A very, very long post. Recommended only for students of Engineering. A long long time ago, in a galaxy far far away, there was an engineering college with an extremely illustrious Mechanical Engineering department whose fame spread far beyond the furthest reaches of the galaxy. “Have you completed the Design project?” Deepak asked. “Gone mad or what? The submission is two weeks away”, replied Nabendu with an air of finality. This was the final semester of the final year. Nabendu was already placed – along with 3/4th of the batch – in a software company and submission of design projects was not his priority. In fact, his only priority was to make dreadful jokes on his employer including one which poked fun at their indiscriminate hires – “Trespassers will be recruited”. With a large group placed and a substantial group accepted in institutions for future studies – truth be told – submission of Engineering Design projects was not anybody’s priority. Usually, these design projects needed a ‘mother’ – a solution (typically done by a topper of the previous batch) – to get going. Once we knew from an acknowledged master how the ferocious flanges were being subjected to treacherous torque, the calculations seemed infinitely easier. And once the calculations were done, slapping a drawing sheet on the previous year’s drawings and tracing it out was a cinch! This being the final year, the ‘seniors’ had already left and finding a ‘mother’ was not proving to be easy. In a rare display of enterprise, Nabendu and Deepak went around asking classmates on the progress of this design project. Of course, you could argue that speaking to 7 classmates over cha-shingara isn’t a great display of enterprise. Even that ended swiftly enough when they found an antakshari gang in the Canteen. Nabendu joined them with gusto and started singing “Romeo naam mera, chori hain kaam mera…” completely out of tune but with exact dance movements. Deepak went home with a mixture of unease (flunking a course in the last semester was the – well – last thing he wanted) and comfort (after all, even Uttam hadn’t started on it). Nabendu and Deepak squabbled unnecessarily for 5 minutes before deciding that the only person who could help in this project submission was the professor himself. Dilip Kumar Chatterjee – DKC for short – was popular for all the wrong reasons. Firstly, he was said to have a comely daughter. Secondly, he was horrendously un-punctual leading to frequent class cancellations. Thirdly, he was – or seemed – as clueless about his subjects as the students he taught! Overall, he seemed to be the sort who could be requested to postpone (or, in the extreme case, cancel) academic requirements without the fear of getting one’s head bitten off. They knocked on his door and waited. After a few minutes, they peeped in and were greeted by an empty room. It was one of those inexplicable things why they still walked in. Nabendu marveled at the empty table and the computer which had probably never been switched on. Deepak saw something else – a cupboard towards the far corner of the room which was so stuffed that the door hadn’t closed properly. The papers inside seemed like… he walked over, took out one of the files, glanced through it, stuffed it in his backpack and was out of the room in a flash. Nabendu caught up with him almost after the jheel. “What the hell did you do?” he asked Deepak after managing to catch his breath. High-fives happened before they both left campus with the firm belief that if God does exist somewhere in the universe, he is probably perched on top of the stairs in the Mechanical Engineering department. Deepak returned the file to Nabendu the next day. He had managed to copy out the entire calculations and the complicated drawing in one marathon night-out. The plan was to finish off both their projects in 48 hours and return the file to the cupboard in DKC’s room. But these things never turn out the way they are supposed to. For starters, Nabendu decided to gloat over their acquisition to half the University and their maternal cousins. Even batchmates in the Electronics department weren’t spared the details of the ‘daring raid’ – which seemed to grow on every successive retelling and soon resembled one of the dangerous expeditions his father – a senior police officer – undertook. Very soon, there was a queue of classmates who wanted the ‘mother’ to finish off their projects and it didn’t look like the file was returning to the cupboard anytime soon. Nabendu magnanimously handed over the file to the queue and remained quite satisfied in telling the story again and again. After a point, Deepak lost track of the people who completed their projects from that file and just assumed that Nabendu would have done it as well. At 9 PM, Deepak was wondering what movie they would be showing on the local cable channel when the phone rang. It was Nabendu. “Do you have some drawing sheets?” he asked strangely. When Deepak put the phone down at 9:32 PM, the Design project was not on his mind. But if it had been, he would have prayed for it to be on Nabendu’s mind as well. “You got the drawing sheets?” Deepak asked as he saw Nabendu’s smiling countenance come through the nervous group of students assembled outside the professor’s room for the final Design viva. Having spent much of the last four years with Nabendu, Deepak knew the solution his friend had adopted was not the conventional one. “Show me your drawing”, he demanded. “Let’s go over to that side. Its emptier.” Nabendu replied with uncharacteristic diffidence. Subbu, Shamik and Dipanjan had gathered around by now. The vivas were conducted in groups of five and their roll numbers were 90 to 92 while Nabendu and Deepak brought up the rear. They ambled over to an empty classroom and Nabendu’s brought out his design file. The design calculations were supposed to be the first 20 pages, which were normal A4 sheets while the large thick drawing sheet was folded at the back to fit into the file. This was not a major problem since project calculations – done under extreme time constraints – of most students were shortened and close scrutiny would reveal many skeletons from the last 4 years. They turned to the Design drawing at the back of the file. “Son of a… what is this?” exclaimed Subbu. The drawing sheet seemed to have been taken straight out of Tutankhamun’s tomb. It was creased, frayed at the edges and had duct-tape holding out the folds. “…I didn’t have any drawing sheet. The store was closed. Nobody in the hostel had any either. On top of that, it was getting late. So, I just erased last year’s name and wrote my name there. Even his roll number was the same as mine…” Nabendu seemed to take this last bit of coincidence as some divine hint that assured him this was the right thing to do. As they stared at the yellowing papyrus with horror, they could hear their roll numbers being called at the end of the corridor. The panic had gripped all four of them. A viva group was susceptible to mood swings of the professor brought about by one bad apple. While none of them were terribly well-prepared, they expected to steer through DKC’s usually calm manner and silly questions with a mix of common sense and obsequiousness. But this cavalier bit of plagiarism had thrown everything off gear. They filed into the room and took their seats in order of their roll numbers. As they handed in their files, the usual greetings were made with a quiver in the voice. DKC calmly took their files and started going through them. Many years later, when Deepak first watched a show called Masterchef and saw the judges pause for inordinately long periods before passing judgments, he was immediately reminded of vivas. DKC went through the first three files with some silly comments and bonhomie, only to be rewarded with nervous grunts. He finally took up Nabendu’s file. He flipped through the pages without too much attention to the details of the calculations. Then, he came to the drawing. His frowned at the duct-tape as he started to unfold (unravel would probably be more appropriate) the sheet. For the first time in their lives, they heard paper creak! DKC’s frown slowly turned into round-eyed amazement as he unfolded the ancient parchment to reveal pencil-cravings from ancient times, probably symbolizing some pagan rituals. The group held its collective breath as he carefully examined the description panel on the bottom right of the sheet. 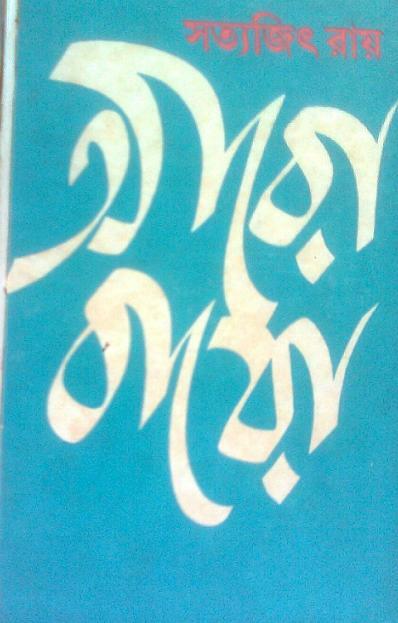 The only bright pencil marks on the sheet seemed to be ‘Designed by Nabendu Mitra’ while the name of the original owner was clearly visible under that as Nabendu’s erasing was clearly half-hearted. DKC fixed Nabendu with a stare as the other four started admiring the ceiling fan, the window grill, the door stopper and the outdated Bengali calendar on the wall. If this had been a movie, a gong would have sounded for sure. But only the murmur of the waiting students outside punctuated the silence. Cue for louder gong… with echo effect. Later in his life, when Deepak had attended many marketing workshops, he got to know of a term called ‘moment of truth’. Whatever the real meaning of the phrase was, nothing came closer like the moment at hand. And DKC decided to lift the dead-weight of the silence with what eventually became the ‘quote of the century’. Deepak had visions of Nabendu running down an airport runway as his father chased him with a revolver in his hand. But he couldn’t laugh as he was too busy wondering what this statement would lead to? Expulsion from the University? Repeating the year? What? Deepak went on to do a MBA and sells soaps for a living now. Subbu, Shamik and Dipanjan joined software firms after graduation. All of them lead large project teams now. Nabendu is also a software engineer and is very curious about computer aided design software that don’t require paper to create complicated designs. All characters are fictional. All the described events are figments of the author’s imagination. Any resemblance to any person, living or dead, is entirely coincidental. For the last few weeks, I have been calling up offices of several production houses in an effort to source photographs for the book I am writing. Everywhere, people picked up the phone and gave directions on what to do next. Only the phone at Navketan kept on ringing.